Opplev Northern Lights ombord på en luksusbåt i løpet av denne 2-timers smågruppen ekskursjon. Sett seil fra Reykjaviks gamle havn for å unnslippe lysforurensningen i byen og få noen av de beste fotomulighetene til Aurora Borealis. Gjester som ikke ser nordlysene på sin første tur kan prøve igjen, uten ekstra kostnad, ved neste tilgjengelige avgang. I would recommend the Amelia Rose for Northern Lights and Whale Watching tours for all travelers to Iceland. The yacht is unique, the crew friendly and accommodating and the whole experience worth the price. We didn't see the Northern Lights on our scheduled tour and came back the next night. There was some light behind clouds on our second try, but not what we had expected. In fact, due to weather conditions, the Northern Lights didn't appear our six nights in Reykjavik. Nature cannot be controlled. 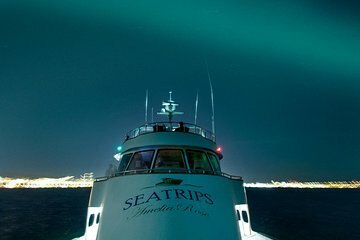 Even though we didn't see the Northern Lights, the experience on the comfortable and warm yacht was fun in itself. Skip the big boats and enjoy the Amelia Rose! We booked for Saturday but unfortunately owing to the weather our tour was rescheduled to the next day. We chose. This was a blessing because Sunday was glorious and the skies clear and Iceland beautiful.The tour starts at 9pm, and you board from 8.40pm - unless you are being transferred there I would find out in advance where you collect your final information and where the yacht will be docked. Thankfully, a taxi driver took pity on us walking round and drove us directly there the day before, so we knew where we were going. We would certainly have missed the tour had we not located the office in advance.The Captain and his assistant are lovely and the assistant super friendly and can get as technical as you desire. We were warmly welcomed and met the other tourists.The yacht is lovely and typical old Iceland money inside. We sailed along as far north as necessary and even moved round looking for the Northern Lights. We were offered blankets as it was freezing on deck, but you can wait inside until the Lights arrive. There are drinks available at very reasonable prices.We stayed out nearly three hours but didn't see the Lights but this didn't detract from a super tour with local and technical knowledge thrown in with oodles of laughs. Importantly, you are offered the opportunity to go out again the next day if you wish, so it may make sense booking early in your trip so you have the chance.Fantastic!